Burning tongue can be a very irritating and painful symptom of menopause. Like the name suggests, burning tongue occurs when an individual experiences a burning sensation on the tongue or in the mouth. Everyone has sipped a beverage such as coffee or tea that is too hot and burned their tongue. This is the sensation burning tongue sufferers experience constantly. Burning tongue affects women seven times as often as men. Women going through hormonal transitions, such as the time leading up to menopause, are at an even greater risk of developing the symptom, because hormonal imbalance is known to cause burning tongue. 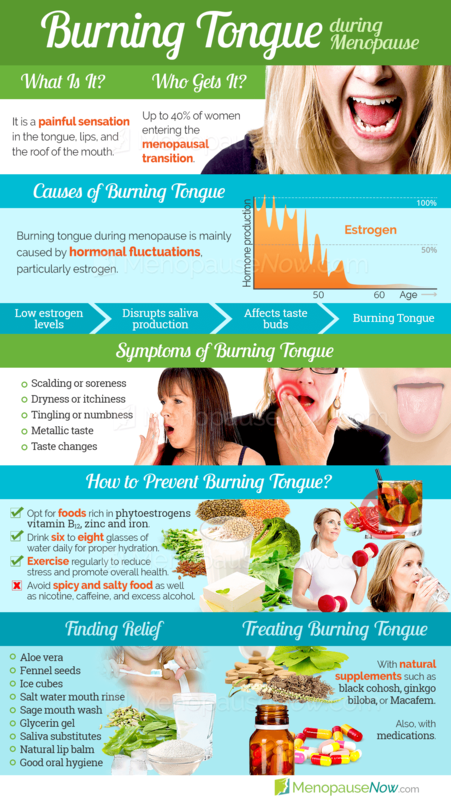 Continue reading to learn more about burning tongue, its causes, and ways to treat it. Burning mouth pain is often absent during the night, but progressively increases throughout the day and into the evening. Also known as burning mouth syndrome, burning tongue has a self-explanatory name. It is also known by its medical names: glossodynia, glossopyrosis, oral galvanism, stomatodynia, and stomatopyrosis. Burning tongue is accompanied by burning pain on the tongue, especially on the tip or back of the tongue, or other areas of the mouth. Following the onset, which is often spontaneous, burning tongue has been known to last for several years. 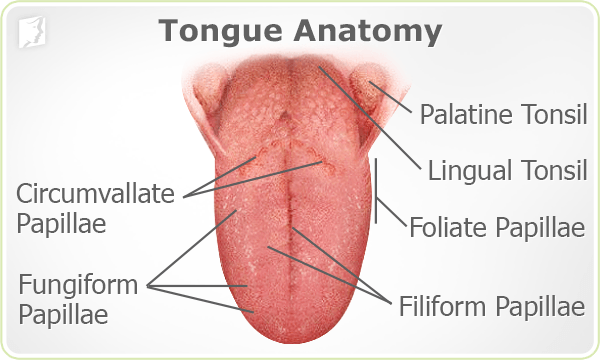 There are typically no visible signs or lesions on the tongue or mouth in those who suffer from it. Other common symptoms of burning tongue are dry, itchy mouth, a metallic taste or numb sensation in the mouth. Please see the image for the full list of common symptoms. Continue reading to learn more about the causes of burning tongue. Tongue pain is not an easy symptom to live with. It contributes to anxiety and mood swings, loss of appetite, and social withdrawal. Numerous conditions can trigger tongue pain from hormonal shifts to mouth ulcers, many of which are treatable and do not result in serious complications. "Supertasters" are individuals with abnormally dense and abundant taste buds who have a heightened sense of taste. Supertasters are affected more dramatically by burning tongue than those with a normal amount of taste buds. Estrogen is known to play a part in the secretion of saliva, which researchers believe can cause burning tongue once estrogen levels decrease. Estrogen also affects the bitter taste buds located at the back of the tongue. Without adequate levels of estrogen, they bitter taste buds may lose their functionality. These taste buds are surrounded by a basket-like collection of pain neurons that activate when the taste buds are damaged by lack of estrogen. If pain or soreness in your tongue, lips, gums, or other areas of your mouth persists for several days, consult a doctor. A doctor can search for the possible causes and recommend treatment options. 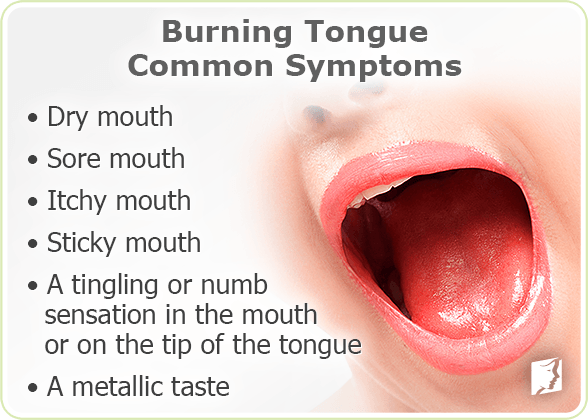 Continue reading to learn the treatment options for burning tongue. Women suffering from a burning sensation around the lips often report that they tend to withdraw from family and friends, becoming less socially active. Check out the main causes and solutions for a burning sensation on the lips here to finally be free of the harrying symptom. Burning tongue sensation is a strange and uncomfortable symptom of menopause that can come on without warning. There are a number of things that may cause it, however, such as nutritional deficiencies, hormonal imbalance, diabetes, certain medications, and teeth grinding. Women can treat this with lifestyle adjustments and herbal supplements. Because burning tongue triggers physical pain and discomfort, those who suffer from it often seek treatment. When exploring treatment options, it's important to begin with methods that carry the least amount of risk and progress from there. Chewing sugar-free gum can be an easy remedy for burning tongue. This means that lifestyle changes are the best place to begin. Some simple tasks can alleviate some of the discomfort of burning tongue. Drinking more water, for instance, can stimulate saliva production and relieve some of the symptoms. It is best to avoid spicy foods, cinnamon, and mint. Typically, combining lifestyle changes and alternative medicines will produce the best outcome. Alternative medicines can be different herbs and supplements, or even techniques like aromatherapy. When seeking out alternative medicines, it is important to find treatments that can balance hormone levels, which target symptoms at the source. Finally, if burning tongue persists, there are different medications and surgeries that can be explored. Medications are often prescribed simply to cope with burning tongue, but do nothing to treat the source of the problem. This final option also comes with the most risks and side effects. Click on the following link to learn specific treatments for burning tongue, which begin with lifestyle changes, move on to alternative medicines, and finally, if those options are ineffective, medications and surgery. The most effective treatments for burning tongue typically combine lifestyle changes and alternative medicines. Women who suffer from burning mouth syndrome often experience a sore tongue, adding to the general overall discomfort and sending them searching for reprieve. Learn more about conventional and alternative sore tongue medicines to finally find the relief you deserve. 03/11/2019 Acid reflux and burning mouth are two wearisome symptoms of menopause. However, what many women may not know is that the two have a common connection. Learn about acid reflux and burning tongue as well as the link between them here. 07/19/2018 Many middle-aged women suffering from a hot mouth sensation do not get properly diagnosed for many months or even years. This unpleasant symptom, which has been linked to numerous conditions, such as diabetes, infections, or tobacco use, can interfere with women's life, making them vulnerable to anxiety and depression. 12/04/2017 Although it is one of the rarest menopausal symptoms, sensitive tongue belongs to some of the least pleasant ones. Although in many cases its causes are unknown, certain lifestyle habits or medical conditions, like low iron or allergies, can also be the cause. Many women find relief in natural supplements or medication. 01/10/2017 Characterized by a painful, scalding sensation, burning tongue syndrome is a serious condition that affects the lives of many women experiencing menopause-induced hormonal imbalance. This article outlines a few specific foods to steer clear of, especially when the aim is to avoid causing further damage by burning your tongue after eating.